In 2014 historian Peter Hinchcliffe reported on the officers of Devon and Cornwall that resigned to enlist with the Army during the First World War in his article commemorating those who lost their life in the conflict. As established in Peter’s previous article it was thought that no officers from the Barnstaple Borough Police resigned to enlist. Historian Mark Rothwell however, has found evidence to the contrary. Through interrogating editions of the North Devon Journal from 1914 to 1921, it has been possible to identify five men from the small North Devon force who swapped the frontline of policing for the frontline of the worst conflict in human history. Police Constable Richard Darch resigned to enlist on 22nd February 1915, and joined the Royal Horse Guards Blues (note: interestingly, the Historic Collections of Devon & Cornwall Police hold no record of a PC Richard Darch in either Barnstaple Borough or A Division Devon Constabulary). 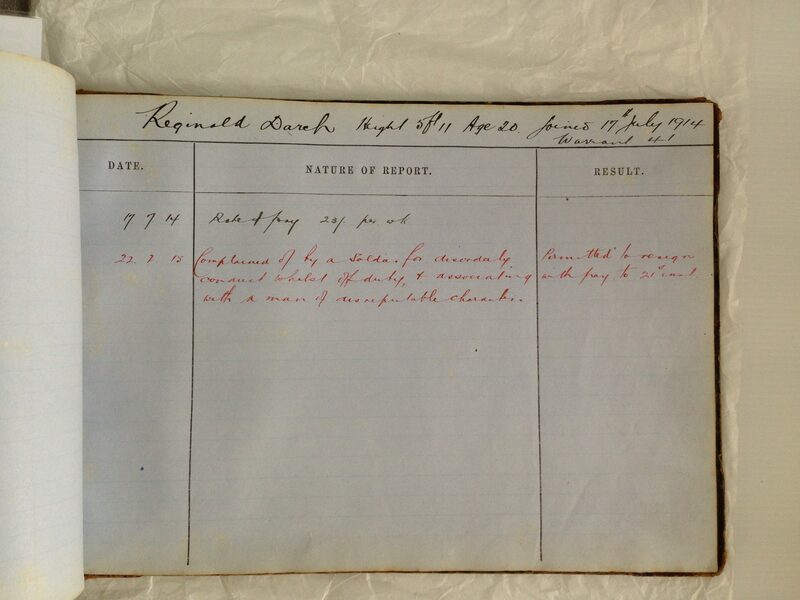 His brother, Police Constable Reginald Darch, followed on 24th February 1915 (note: see above discipline record; Reginald had been ‘permitted to resign’ three days’ previously), and was seriously wounded on 5th July 1917. An Army Chaplain wrote from the front that “the wound necessitated an operation to the knee” and that he “could not say whether it would mean permanent injury or not.” Research proves the latter to have been true, and Reginald was granted honourable discharge from the Coldstream Guards on 1st March 1918. What is remarkable is that Richard and Reginald were two of six brothers all serving on the Western Front at the same time. Two of their brothers, Walter and William, died on active service. William, aged 29, died from malaria in Mesopotamia (modern day Iraq) on 17th December 1916, and Walter died from wounds in France, also aged 29, on 9th September 1918. Tragically, Walter wrote home to his parents only a week prior, saying that he hoped to come home on leave soon. Brothers James and Albert enlisted with the Royal North Devon Hussars and Royal Marines respectively. While Albert was able to complete his military service, James received serious wounds and was invalided out of the Army. Police Constable Samuel Gammon resigned to enlist in March 1916 and is recorded as returning for a brief period of leave in May 1916. Gammon was demobilised in 1919 and resumed his police duties after the war within Devon Constabulary. His brother, Artie, was a police officer from a Welsh constituent force and was wounded and sent home in October 1917. 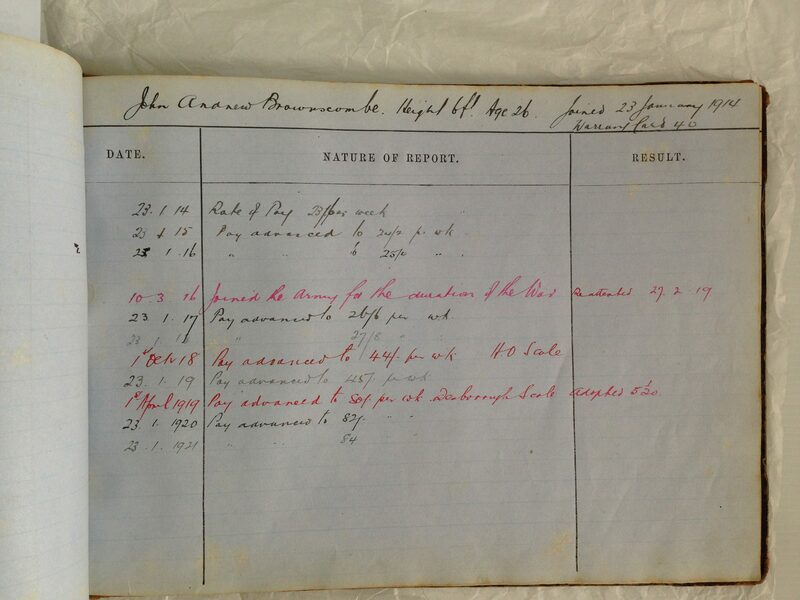 Finally, Police Constable John A. Brownscombe resigned to enlist in March 1916 and joined the Royal Marines Artillery. His resignation from the force, along with others, was reported in the North Devon Journal, and it was remarked that the Barnstaple police was left “four-below strength” as a result. He was demobilised in 1919 and returned to the police force, joining Devon Constabulary. Written by police historian Mark Rothwell with comments by Carmen Talbot; all images copyright of the Historic Collections of Devon and Cornwall Police. Featured image: Barnstaple Borough Police, c.1920.